Afghan officials warned recently that terrorists from Pakistan are infiltrating into Wardak Province near Kabul as security deteriorates amid suicide bombings and insider attacks by the Taliban. According to U.S. officials, the governor of the province, Abdul Majid Khogyani, went public on June 2 in a meeting with the Afghan National Security Council with his concerns about Pakistani militants moving into Wardak, located 25 to 30 miles from the capital of Kabul. Additionally, Afghanistan’s Interior Minister Mujtaba Patang on June 5 announced that foreign terrorists were fighting alongside the Taliban in Wardak. Other Afghan officials said the foreign fighters pose a significant threat to the capital. The terrorists were detected travelling to the region from Pakistan’s remote Waziristan province. Wardak is known as a hotbed for Taliban terrorists and Islamist fighters belonging to the group led by Gulbidin Hekmatyar. 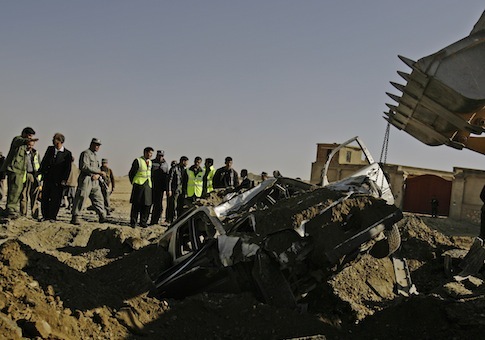 Concerns about Wardak come amid a series of high-profile terrorist attacks involving both bombings and insiders who turn on Afghan police and troops. The violence in recent weeks is considered the highest levels of violence in the 12-year war. Afghan security forces are slated this month to take over completely as the lead forces for security in the country from U.S. and NATO forces. Afghan President Hamid Karzai, under pressure from local tribal leaders, ordered all U.S. Special Operations Forces out of Wardak in February. However, the U.S. military has resisted the order over concerns it would undermine the war effort against the Taliban. Anti-U.S. sentiment in Wardak remains high as a result of Taliban propaganda blaming U.S.-trained Afghans for committing abuses against local citizens. The increase in foreign fighters to Wardak undermines a key U.S. policy objective in Afghanistan of keeping the southwest Asian state from once again becoming a base for foreign terrorists. Pentagon and International Security Assistance Forces spokesmen declined to comment on the deteriorating security situation in Wardak. Rep. Duncan Hunter (R., Calif.), a member of the House Armed Services Committee, said Karzai is "shooting himself in the foot" by demanding the pullout of commandos from Wardak. "As extremists move into that province there are going to be more attacks on Kabul," Hunter said in an interview. "So their defense-in-depth of Kabul is going to get eaten away." Hunter said the deteriorating security situation in Wardak is an indicator of what will happen if not enough U.S. and allied troops remain in Afghanistan after the deadline for the majority of troops to be pulled out by next year. Ahmad Majidyar, an Afghanistan specialist with the American Enterprise Institute, said the influx of terrorists appears linked to summer recess for radical Islamists from madrassas in Waziristan and North Waziristan. Extremists travel to Afghanistan to join the Taliban during the summer, he said in an interview. "This is part of the spring offensive," Majidyar said, who added that Afghanistan’s army chief last week accused Pakistan of sending some 200 agents to Afghanistan to fight against the Afghan government and U.S. and allied forces. "No significant action has been taken against the Taliban in Wardak and local officials are worried," Majidyar said. He described Wardak as the "gateway to Kabul" and said the Taliban’s immediate goal is not to seize territory but to conduct spectacular suicide bombing and insider attacks to undermine the Afghan government. Hunter also warned that security problems in Wardak could translate into greater attacks on the Afghan capital. "The closer the Taliban are to Kabul, the more chance they have of doing that," he said. The Taliban know U.S. forces are leaving the country and that without U.S. support the Afghans will not be able to operate effectively against the insurgents, Majidyar said. U.S. and allied forces also have concentrated their counterinsurgency efforts in other parts of Afghanistan, leaving Wardak and Kabul vulnerable to what is taking place, he added. The Taliban have been focusing on building up insurgent forces in Wardak to be closer to Kabul when U.S. forces withdraw. If security continues to deteriorate in Wardak, it could affect the national elections set for next year, Majidyar said. Gen. Joseph Dunford, commanding general of U.S. and allied troops in Afghanistan, said in March that Wardak would transition to Afghan security forces but "the only issue is the timeline and the methodology and we’re still working on that." Dunford told reporters that Taliban terrorists have used disinformation, alleging abuses by foreign forces. Six Afghan policemen were found on Thursday shot to death at a checkpoint in the southern part of the country. Two other policemen went missing and are suspected of carrying out the insider attack. The Washington Free Beacon reported last month that U.S. and allied forces in Afghanistan were braced for a surge in insider attacks following a statement by the Taliban that they plan to increase the use of the covert tactic. The number of insider killings has increased sharply since then. Meanwhile, coalition forces announced on Wednesday that a combined Afghan-allied security force conducted a successful raid in Wardak. Four "extremists" were killed and one wounded during a search for a senior Taliban leaders in a district of Wardak. The senior Taliban leader controls about 70 fighters that have engaged in attacks on Afghan and coalition troops, the ISAF said in a statement. "He also oversees local weapons trafficking and reports on extremist operations to higher-ranking Taliban officials," the statement said. Outside Wardak, successful military operations were carried out in Kandahar, Nangarhar, and Paktika province. U.S. and Afghan troops in Logar province killed four extremists during a search for a senior Haqqani network leader who plans attacks and facilitates the movement of enemy weapons and fighters in the area, the statement said. Michael Rubin, another AEI expert on Afghanistan, said nature abhors a vacuum "but the Taliban aren't natural." "Wardak has been the superhighway for Taliban infiltration into Kabul," Rubin said in an email. "At the same time, it should be a crystal ball about the future of Afghanistan post-withdrawal: Obama can't look at Wardak and pretend he didn't see what was coming in Afghanistan. That said, by ordering the U.S. out of Wardak, Karzai also has blood on his hands." This entry was posted in Issues and tagged Afghanistan, Hamid Karzai, Joseph Dunford, Middle East. Bookmark the permalink.